this months discounts 20% Use discount code "may"
Due to decisions made by the committee of the Gold Coast District Orchid Society Inc. that are not in the best interest of Orchid Den we have decided to discontinue the new growers meetings previously held prior to the monthly meeting of Gold Coast District Orchid Society Inc. We understand that the new growers meetings continue however they will not be run by Orchid Den. Orchid Den will be in attendance at the following meetings with a selected range of its orchid growing products. NOTE: We do not take our full range of products to club meetings. If you require specific products you should order on line and we will bring them to the meeting. 26th May 2018 - Gold Coast Succulent and Bromeliad Society Monthly Meeting - at the Helensvale Community Centre, 31 Discovery Drive Helensvale QLD - Large quantity of Succulents and Bromeliads will be on sale. Orchid Den will be in attendance from 11.00am to 1.00pm with a selected product range. Orchid Den is situated under the verandah. HAVE YOU BEEN TO AN ORCHID SHOW RECENTLY? What a great place to gather information! Beautiful plants benched by the growers on the competition tables. Commercial Vendors and club members plants on sale. The larger shows have orchid growing products for sale. There are avid orchid growers there, usually only too willing to answer your questions.By visiting orchid shows at various times throughout the year you will see the different types of orchids in flower at that time. These orchids are grown by members in that area. It gives you an idea of what you could achieve.There is the opportunity of having an orchid in flower the whole year, not the same one, but a variety. Unfortunately what the heart desires is not always what will grow in your environment, but when you find it you will be rewarded. You don't need a large garden as orchids come in many sizes, from miniatures to WOW! Join your local orchid society. They usually have a library and magazines for you to borrow. Members sell plants because they have bought more and need the space and are on hand to answer your questions. Orchid societies need new members, without them, there will be no shows and how sad will that be! Woodburn Evans Head & District Orchjid and Foliage Society Inc. Annual Mother's Day Weekend Show. Saturday May 12th and Sunday May 13th. Quality plants on the competition tables. Great plants available for purchase on the members Stand. Orchid Den will be there with the Orchid Growing Products on sale. Purchase on line, click on the product link. 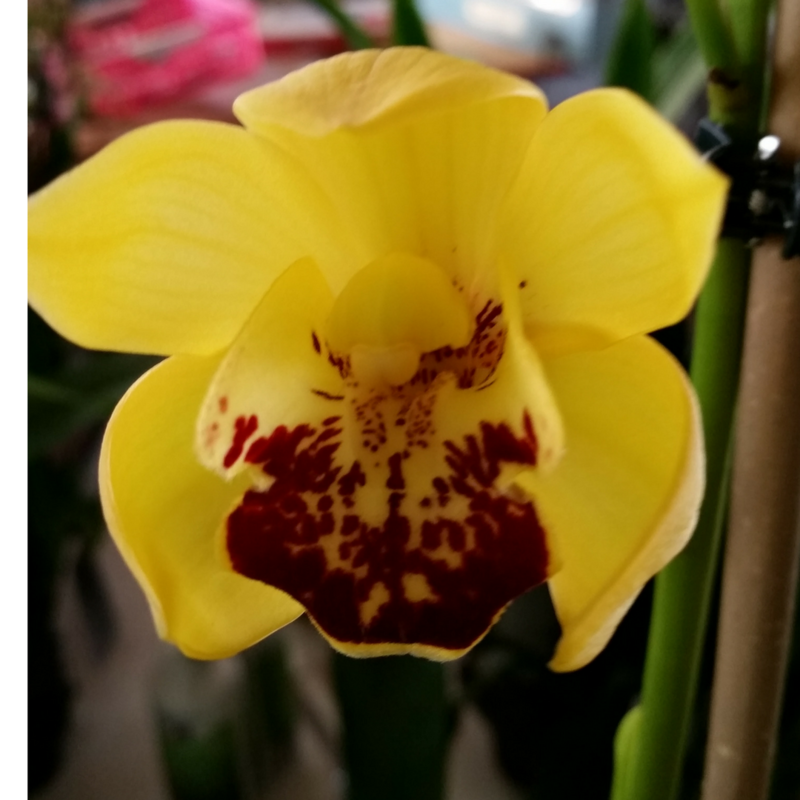 Purchase from an Orchid show that Orchid Den is attending. Australia has 3 native tropical Cymbidiums. Cymbidium canaliculatum, Cymbidium madidum and Cymbidium sauve. Most cymbidiums grown in Australia are cool growing hybrids and are often difficult to flower in tropical coastal areas. Tropical Cymbidium "The Brightest is a hybrid grown and flowered on in S.E Qld. Unlike cool growing orchids this orchid will flower regularly through out the year when grown in the tropics. What is interesting is that it will flower as far South as Melbourne and Adelaide, however it reverts to flowering annually. Grow in a light well drain mix. 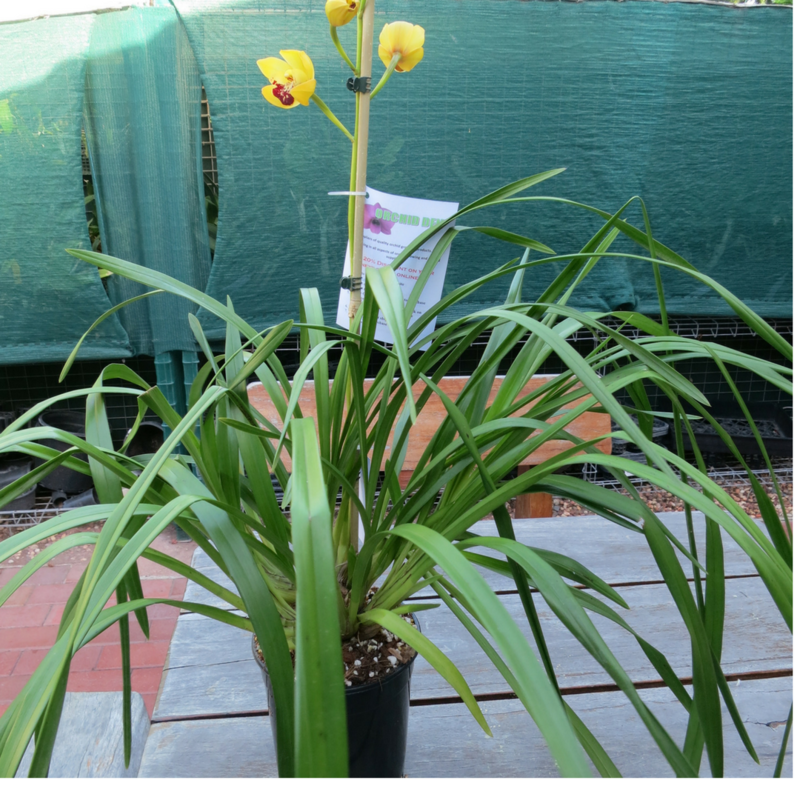 Do not use your normal Cymbidium mix. Orchid Den recommends that you grow in Orchid Den's Phalaenopsis and deflasking mix. Water every few days in hot weather and weekly during winter. Fertilise regularly. 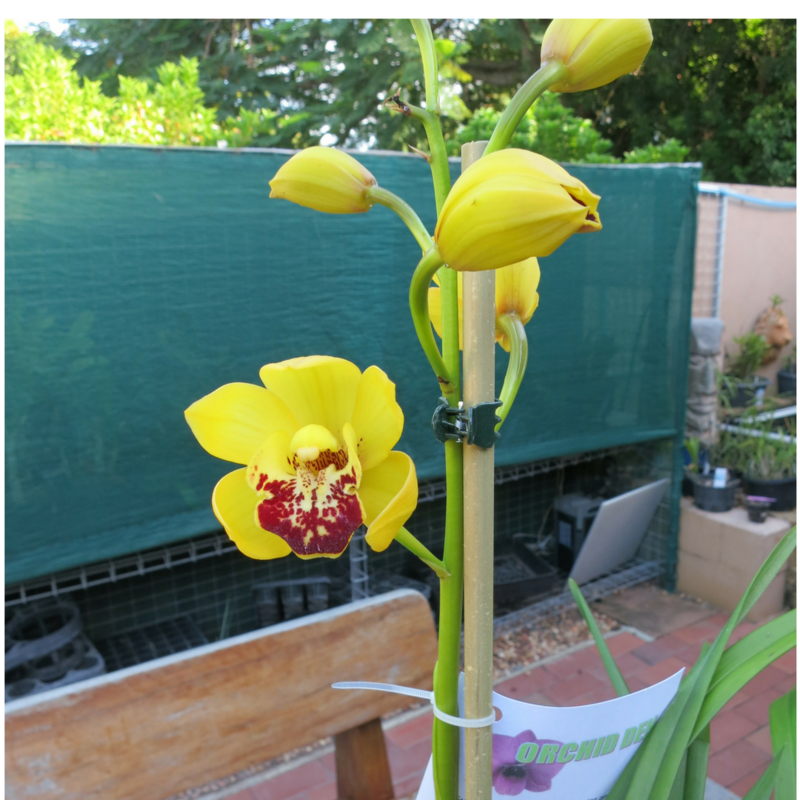 Orchid Den recommends that you spray with a liquid fertiliser every time you water (use at 25% of the manufactures recommended rate). In addition use a good quality slow release fertiliser, one that will not burn the roots of the plant. Orchid Den recommends Orchid Boost 10N 10P 10K liquid fertiliser and Organic link slow release fertiliser. The other morning I was driving to the Brisbane Orchid Societies Show. I saw the most magnificent rainbow. It was a full rainbow and the end of the rainbow was under my vehicle. I don't think I have ever been at the end of a rainbow before. Well everyone knows that there is supposed to be a pot of gold at the end of the rainbow.